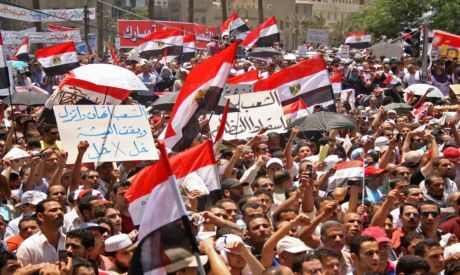 Tahrir protesters’ dissent grew notably fiercer after the Supreme Council of Armed Forces (SCAF) issued a statement on Tuesday afternoon. Demonstrators vowed to continue their sit-in until the ruling military council steps down as they began gathering for a “million man march” to the cabinet’s headquarters. SCAF is running the country on a temporary basis following the ouster of former president Hosni Mubarak on 11 February, but are being put to the test by protesters who began an open-ended sit in last Friday. Angry demonstrators say they are concerned about the delays of trials of the former regime and police officers charged with killing more than 800 protesters during the popular 18-day revolt. In a statement broadcast on television, SCAF spokesman General Mohsen El-Fangari gave Prime Minister Essam Sharaf a vote of confidence and reiterated their commitment to hand political power to a civilian administration at the end of the year. El-Fangari also issued a stern warning “to anyone who would disrupt public order and services,” likely referring to the protesters’ decision to shut down the Mogamma, Egypt’s largest administrative building and to the civil disobedience tactics taken by Suez protesters yesterday, including blockading the Ein el Sokhna road and threatening to cut ship passage through the Suez Canal. “First of all, we firmly reject the threatening tone SCAF used in today’s statement,” one of the youth protesters shouted through a microphone from Tahrir’s main podium. “Secondly, we announce that we do not accept this statement, which did not mention anything about the demands and the aspirations of the revolution. “Finally, we have decided to continue our sit-in, which will remain peaceful, until our full demands are met,” he added, as persistent chants started up demanding that SCAF should go. Many of the protesters also lifted up their shoes – an insulting gesture – after listening to SCAF’s statement, while others chanted against Field Marshal Mohamed Hussein Tantawi, the head of the ruling military. “Who are you to make decisions on a matter like that,” an old woman seeking to finish paperwork in the Mogamma grumbled. Others echoed her complaint but the sound of their voices was drowned out. Most of the chants were directed against SCAF as the majority of demonstrators believed Sharaf is no longer in power. Sharaf issued a statement on Monday night which also failed to placate protesters' anger. “SCAF’s statement was a farce! They did not say anything useful. They did not take any measures,” political activist Mohamed El-Khouly told Ahram Online. “We respect Sharaf, he is a well-mannered man but he does not have the authority to make any decisions. Everything lies in the hands of SCAF who are deliberately ignoring our demands. “The ministers of the old regime are still in their position. I want anyone to tell me, for example, why SCAF are determined to keep hold of Sayed Meshaal (minister of military production) in the cabinet,” said El-Khouly.